The photograph from the 1930s shows our building as the old Post Office, repaired after 2 fires devastated Bridge Street in the early 1900s. A lot has happened since the fires. After the once clapboard building was sheathed in brick, it went on to serve our community as the Bancroft Post Office for 57 years. 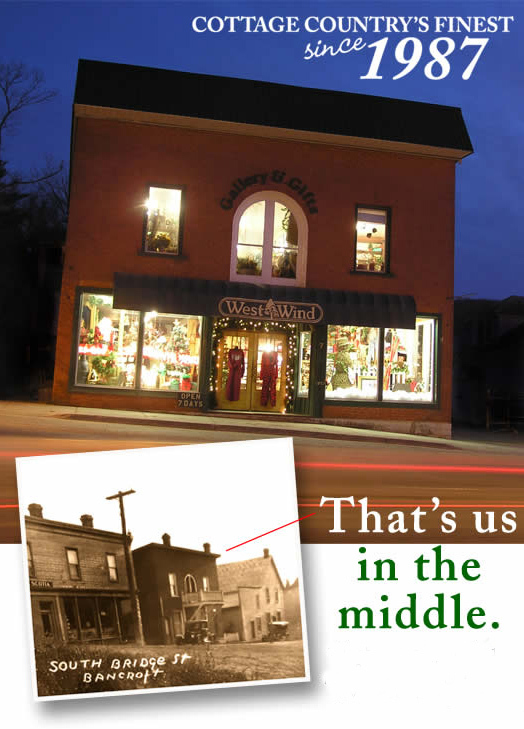 It wasn't until 1995 that West Wind moved from it's previous location next door into the century old building. 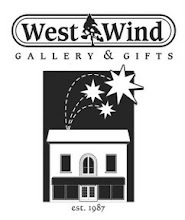 West Wind has been providing our loyal customers with unique, quality items since 1987. We carry a broad selection of giftware, art, stylish home decor, and casual clothing for men, women, and children--all in a fun, relaxed no-pressure atmosphere. With name brands like Woolrich, Tilley Endurables, Hatley, Wigwam, Laurentian Chief, Teva and many more, you're assured to find quality items you'll enjoy for years to come. We're located in the heart of historic downtown Bancroft, at the intersection of Bridge Street and Hastings Street. Restaurants, shopping, hiking trails, parks, and the theatre are all within walking distance of our store.